Modernity has been an age of revolutions—political, scientific, industrial and philosophical. Consequently, it has also been an age of revolutions in theology, as Christians attempt to make sense of their faith in light of the cultural upheavals around them, what Walter Lippman once called the "acids of modernity." Modern theology is the result of this struggle to think responsibly about God within the modern cultural ethos. In this major revision and expansion of the classic 20th Century Theology (1992), co-authored with Stanley J. Grenz, Roger Olson widens the scope of the story to include a fuller account of modernity, more material on the nineteenth century and an engagement with postmodernity. More importantly, the entire narrative is now recast in terms of how theologians have accommodated or rejected the Enlightenment and scientific revolutions. With that question in mind, Olson guides us on the epic journey of modern theology, from the liberal "reconstruction" of theology that originated with Friedrich Schleiermacher to the postliberal and postmodern "deconstruction" of modern theology that continues today. 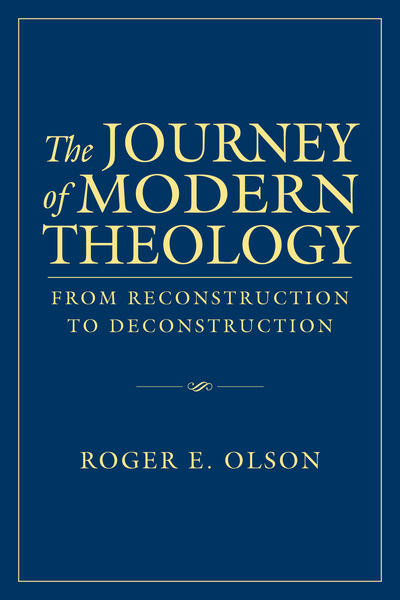 The Journey of Modern Theology is vintage Olson: eminently readable, panoramic in scope, at once original and balanced, and marked throughout by a passionate concern for the church's faithfulness to the gospel of Jesus Christ. This will no doubt become another standard text in historical theology.